Are you tired of making New Year’s resolutions that fizzle and die before Valentine’s Day? You’re not alone! Research shows that 80 percent of resolutions fail by the middle of February. You may feel like the odds are stacked against you, but you can make this year different. If you truly want to change your life for the better, now is the time to do it. Steel Fitness Riverport of Bethlehem personal trainers offer five simple tips to help you start the year off right so your fitness resolution for 2019 sticks throughout the year and for years to come! Most people give up on their New Year’s resolutions because they never really took them seriously in the first place. If you want to live a fit and healthy life, it all starts with your mindfulness & mindset. You must understand that your goal is not a temporary fix, but a permanent lifestyle change. Before you do anything, ask yourself why you want to make a change. Do you want to stay healthy enough to keep up with your grandchildren? Is there a little black dress you’re dying to fit into? Whatever your reason, write it down. This will help you regain your focus when things start to get tough. Your fitness resolution for 2019 shouldn’t be a fantasy. If you immediately resolve to go to the gym seven days a week and that’s not realistic for your current fitness level and lifestyle, you’re just setting yourself up for failure. Instead, start with smaller, more reasonable goals, like going to the gym three days a week. This will give your body and mind a chance to acclimate to your “new normal.” As you accomplish these smaller steps, keep pushing yourself to gradually work your way towards your long-term goal. 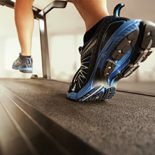 Being more active is a critical part of any fitness resolution. No matter what your current fitness level is, adding more exercise into your life doesn’t have to be torture. The key to success lies in finding ways to make exercise fun. If running or lifting weights doesn’t excite you, try taking a yoga class, sign up for an outdoor training course, or give AntiGravity Fitness a whirl. Don’t be afraid to mix it up and try different things. This will help keep you from getting bored, and you may just find a new passion. Cleaning up your diet and staying hydrated are also critical for making your fitness resolution for 2019 a success. All of the exercise in the world won’t help you if you’re not giving your body the fuel it needs. Start by cutting out fast food, chips, candy, soda, and other sources of empty calories. Replace these foods with healthy snacks like apples with peanut butter, veggies with hummus, and high-quality protein shakes. Drinking plenty of water throughout the day will help your body function properly while also curbing your appetite. Understand that you will have setbacks. Don’t turn a small mistake into a big one by throwing in the towel when you start to get off track. Everyone misses gym days once in a while, binges on birthday cake, and has days when they just don’t feel like doing it anymore. If the reasons you wanted to get healthy haven’t gone away, then don’t quit. Pick yourself up, dust yourself off, and get back to it. If you’re ready to dominate your fitness resolution for 2019, start with Steel Fitness in Bethlehem. Let’s Crush the New Year together. Check out our FREE 3 Day Gym Pass!